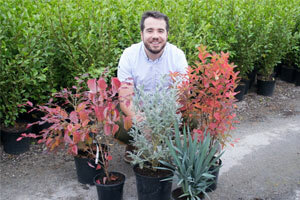 Kyle Ross, Production Manager at Wyevale Nurseries based in Hereford, explained: “We have been trialling and testing these plants over the past two years to ensure the crops we put forward are the absolute best for our customers. Amelanchier ‘Rainbow Pillar’ – a compact, upright small tree, which is mildew tolerant. Teucrium fruticans ‘Selection’ – round and tough silver foliaged with purple flowers, an excellent Lavandula alternative. Sycoparrotia ‘Purple Haze’ – a rare new introduction. A low growing and spreading shrub, autumn foliage colours of purple, yellow, red and orange. Viburnum nudum ‘Brandywine’ – an excellent, branching plant with glossy red leaves. Viburnum dentatum ‘Blue Muffin’ – eye-catching, upright with diamond leaves. Multi-functional use within planting schemes or hedges. Dianella ‘Blue Stream’ – a clumping Dianella, strong and vigorous with Glaucus blue foliage. Anthyllis Barba-jovis – Jupiter’s Beard – this coastal specimen boasts an incredible upright habit, with feathery silver foliage. Perfect as a focal plant. Euonymus ‘White Spire – brand new to the trade and a Wyevale Nurseries’ exclusive, this compact shrub has some of the best variegation Euonymus has to offer. It can be used as hedging or for border planting. John Lawrence, Amenity & Landscape Sales Key Account Manager at Wyevale Nurseries, added: “We’ve seen a growing demand from our customers looking to bring added value to their plant schemes, be it different colours, different textures or the need to respond to challenging site conditions like we saw with this year’s hot summer.